Connect 25 to 500 ft.
Connect up to 375 ft.
Co-axial light strings are made with a heavier 20 awg wire versus 22 awg for standard strings. This heavier gauge wire makes the strings longer lasting and extra durable, perfect for longer runs. Unlike traditional end to end connections, the co-axial screw on connector provides a much stronger bond that cannot be pulled apart and creates a watertight outdoor seal so that no moisture can penetrate the string. You can connect up to 420 watts for lights using 20 awg wire. So depending on how many lights are on the string you could connect up to 1,500 ft. together! If you've landed on this page, chances are you're serious about finding durable, long lasting light strings that are impervious to harsh weather conditions. You expect high quality professional grade commercial Christmas lights that will complement your project, not complicate it. We're glad you made it here, because we're passionate about providing professional light installers and holiday decorators with the dependable lighting they need to get the job done right. 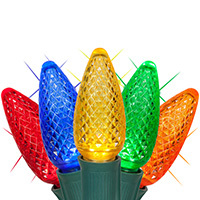 Our commercial grade Christmas lights are designed with long term use in mind. 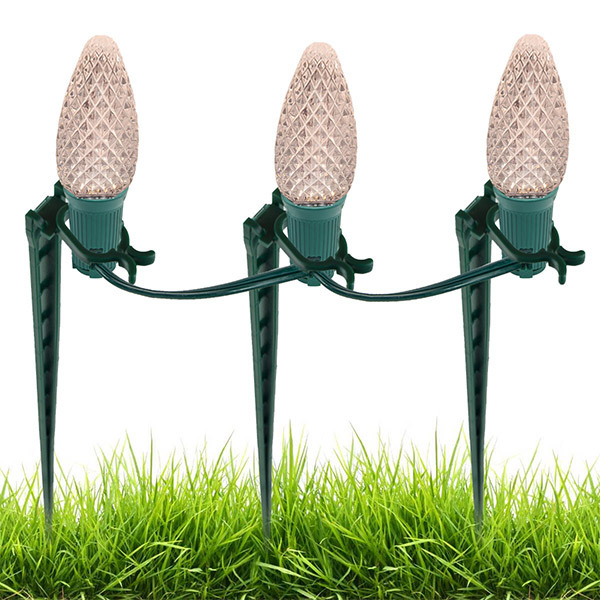 To increase longevity, several varieties of LED commercial light string sets include features like coaxial connectors which form a water-tight seal between sets, heavy duty 20 gauge wiring which makes longer light runs possible and a solid one-piece construction to keep moisture out of the bulbs. If your project requires a customized color scheme or alternating bulb selection, we have a variety of C7 & C9 commercial stringers with removable bulbs which enable you to switch up your light displays as needed. Many of our products are also covered by warranties of up to 3 years, giving you peace of mind so you can do what you do best - create incredible holiday displays year after year. Our products are used by commercial decorators, companies, retailers, and even major movie studios throughout the U.S. because they love our variety and quality, and because we have a full time account team of industry veterans with decades of hands on experience who can help find the right product for almost any project. When you work with Wintergreen you are getting the highest quality commercial Christmas lights, a dedicated team of professionals and access to an established company with a 100,000 sq. ft. facility that can ship in stock orders the same day or store your purchases until you are ready to have them shipped as part of our early buy program. From small packages to entire containers, we ship thousands of orders annually and pride ourselves on a 99.9% shipping accuracy rate. If you need your commercial Christmas lights order to arrive complete and quick, we've got you taken care of. Christmas lights aren't one-size-fits-all and you shouldn't be limited by a selection that only covers the basics without addressing the need for creative options. As lighting technology continues to expand, we will continue bringing in innovative new styles year after year, because we know diversity is key to holiday displays that surprise and delight. When you work with Wintergreen you'll get access to new products before the mass market, which gives you the opportunity for advanced planning. 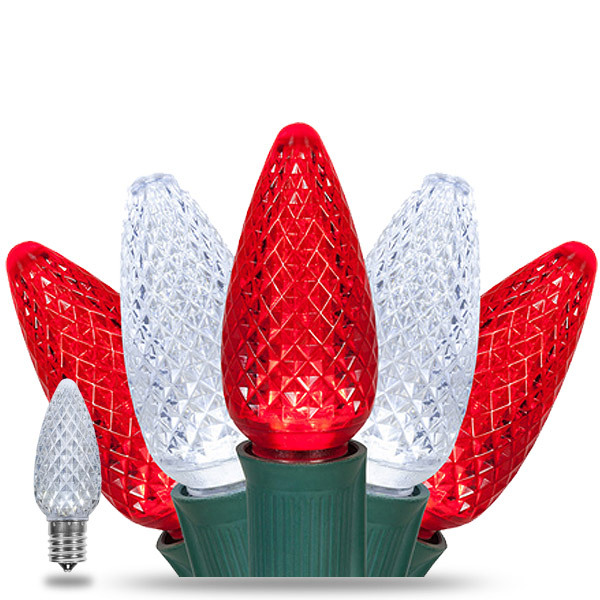 If our quality products and unmatched level of service appeal to you, we encourage you to browse through our commercial Christmas lights and other categories you may be interested in on our site, then create an account with us if you like what you see!